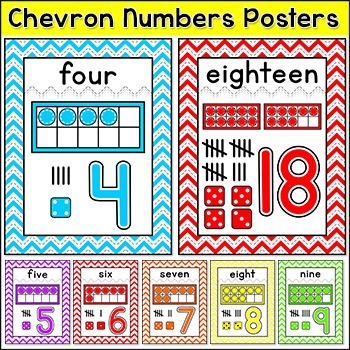 Chevron Classroom Theme Numbers Posters: These bright Chevron Rainbow theme number posters will look fantastic on your classroom wall! 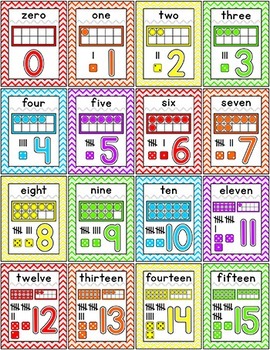 Each poster has the number, the number word, tally marks and a ten frame representation of the number. An editable PowerPoint file is included that will allow you to change the number word to your language. BUNDLE DISCOUNT! This product can be purchased at a great discount as part of my Chevron Decor Bundle. 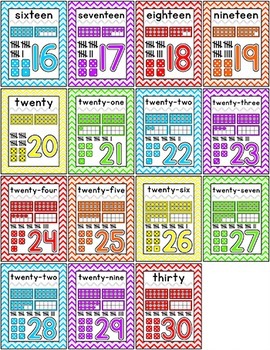 This product includes a set of 30 posters for the numbers 1 to 30. The posters are 8.5” by 11”. 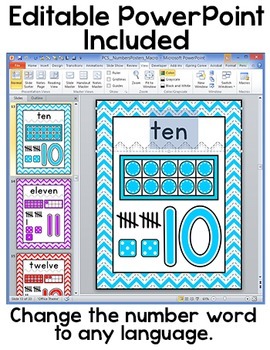 This product includes two types of files: an English version PDF and an editable PowerPoint file so that you can change the number words to your language. You must have PowerPoint installed on your computer in order to edit the file. To Edit: Click on a number word and then delete the text. Type in the new word. You can also change the font size, the font and the number word if desired.